Apple stock fell another 2% yesterday to close at $442. It’s down again this morning. The stock is now closing in on its lowest closing price since it peaked just above $700 in September. Apple is now down almost 40% from its peak. Apple’s market value has now lost about $250 billion. Thanks to Apple’s massive size, that’s more money than investors in Hewlett-Packard and Research In Motion have ever lost in those two stocks combined. 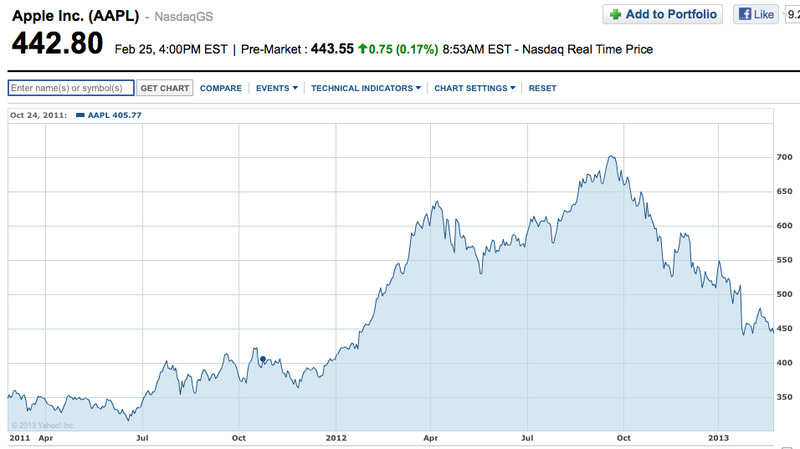 Of course, Apple has only fallen to a level that it first breached in January last year. So long-term Apple investors are still in the money. At least for now. (For the first time in forever, though, anyone who has bought Apple in the past year and held it has lost money on it). What’s going on with Apple’s stock? How low could it go? On the first question, there are several things going on with Apple’s stock. Some are fundamental, having to do with changes in Apple’s business. Others are related to sentiment and changes in Apple’s shareholder base (“Momentum” and “growth” investors are dumping the stock, on the theory that Apple’s growth days are over. And as they dump it, the only folks willing to buy it are “value” investors who care deeply about price).One of the things that is not happening with Apple’s stock anymore, which many people thought was a big reason for Apple’s collapse at the end of last year, is tax-related selling. Tax rates have already gone up. So anyone selling Apple now is selling it for reasons other than trying to lock in a low capital gains rate. First, Apple’s earnings are no longer growing. On the contrary, this quarter, Apple’s earnings are expected to shrink year over year. Investors don’t pay a lot for the stocks of companies where earnings are shrinking. Second, several reports have suggested that Apple has been cutting orders for this quarter for its most important product, the iPhone. Late last year, for example, according to UBS and other sources, Apple cut its “build” orders for iPhone 5s from 35-40 million units to 25-30 million. There have been other reports that iPhone 5 sales are decelerating faster than expected and that Foxconn, Apple’s iPhone assembler, has frozen hiring. All this suggests that sales of the all-important iPhone in the first quarter may be far lower than Wall Street has been expecting. It also suggests that the iPhone 5 has not been the colossal hit that Apple needed it to be. Apple refreshed its entire product line last fall, and we’re in the middle of what amounts to a new-product blackout period. Analysts expect that we’ll get something new from Apple in March, but it’s not clear what. The next iPhone, meanwhile, isn’t expected until June, and it is likely to be a boring minor upgrade to the already underwhelming iPhone 5. (In the meantime, Samsung will have launched its new Galaxy S4). Later this year, we’ll probably also get a new iPad Mini, but that won’t be that exciting, either. The only potential for real excitement is a blockbuster new smartwatch (iWatch) and an amazing new Apple TV. But the latter has been expected for two years now, and it’s not clear whether Apple really has a chance to do anything revolutionary or cool here. Apple’s amazingly high profit margin is declining and is likely to continue to decline over the next several years, as Apple’s product mix shifts toward lower-margin tablets from the high-margin iPhone and the iPhone margin itself declines with the introduction of lower-priced phones. This suggests that Apple’s earnings are likely to grow more slowly than revenue, in contrast to the situation for the past 5 years. One of Apple’s next revolutionary new products–a TV or TV device of some sort–always seems to be about a year away, with the expected date of release perpetually getting pushed farther into the future. Analysts are also not sure what this product will be and how it will sell. Dozens of companies have tried to reinvent TV over the last 15 years, and almost all of them have failed. Apple also appears to have met resistance from the TV content and distribution industry, which will do everything it can to preserve the status quo. The timing of Apple’s other expected revolutionary new product, a smartwatch (iWatch), is also still uncertain, and it’s not clear whether consumers will actually see a need for this product. The iWatch is also likely to be relatively low-priced ($99? $199? ), so the company would have to sell a boatload of them to really move the needle. The profitability of the watch is also not clear. The smartphone market, which has driven Apple’s spectacular iPhone sales over the past 5 years, is entering a new phase, in which low-priced phones are capturing most of the market share. Apple does not yet offer a low-priced phone, so it is missing out on this growth. If Apple does release a new cheap iPhone this year, as is widely expected, this will likely add to the pressure on Apple’s profit margin. Apple’s competitors are catching up in smartphones and tablets (and now, possibly, in prospective TVs and watches), so Apple no longer has the leverage with distributors and consumers that it once did. Samsung and Google in particular are stealing much of Apple’s thunder (and potential customers). This, too, could eventually lead to more margin pressure, as Apple is forced to cut prices to remain competitive. Apple recently had to do this with a new Mac. Lastly, Apple really has finally entered the “post-Steve Jobs” era, and it remains to be seen how successful the company’s next generation of leaders and products will be. 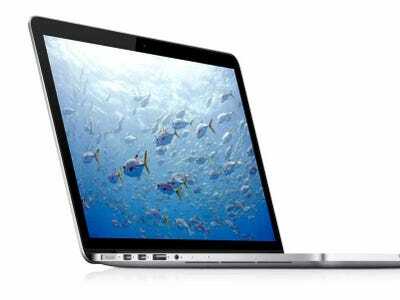 One Apple observer, Paul Kedrosky, recently blamed Apple’s inability to meet demand for its new Macs on a culture in which no one will say “no” to Apple’s design teams. Others dispute this, but the broader question is whether Apple’s leadership team will be able to drive the company forward smoothly and aggressively without Steve Jobs. All of these factors are likely weighing on Apple’s stock. The stock is now cheap. Apple is now trading at 10X trailing earnings per share. That’s not screamingly cheap. Apple could certainly get “cheaper,” especially if its earnings continue to decline. In the old days (mid-1990s and earlier), hardware stocks used to trade between 8X-12X earnings, and Dell, HP, and other companies are actually trading at even lower multiples than that now. (Dell is going private at about 8X earnings. HP is trading at 5X next year’s estimated EPS). But unlike HP, Dell, et al, Apple is still a healthy company, so if Apple ever gets to 8X earnings, it will be screamingly cheap. At 10X earnings, Apple is just cheap–cheaper, for example, than the stock market as a whole. And Apple also has $137 billion of cash. Factor out that cash, and the value of the business itself is actually getting close to the Dell level. What will Apple’s stock do from here? No one knows, so don’t get fooled into thinking that there’s some guru out there who can tell you definitively. Apple may release some exciting new products later this year that will get investors buzzing and cause them to pay, say, 14X for Apple’s earnings instead of 10X. And that will produce a nice jump in the stock. Or Apple may be in the early innings of a long secular decline in which it eventually becomes the equivalent of Dell (or, worse, Nokia. Or Digital Equipment Corporation.) That depressing future is entirely possible, so don’t delude yourself into thinking that it isn’t. One thing we can say, though, is that, at 10X earnings, Apple looks cheap and is still in robust financial health. That means that even modest unexpected good news may drive the stock significantly higher.